We understand each patient and her unique needs. We focus on providing the highest quality medical care to our patients. We work closely with highly trained specialists in order to provide the best possible and comprehensive care for our patients. Our mission is to provide each of our patients with highly skilled and compassionate care. "By far the best experience I've ever had with an OBGYN practice." "Had a great birth experience with the group! Highly recommend." "I love their sweet, friendly and knowledgeable staff. Always a great experience!" "Dr. Gurdian is an amazing and caring physician." "Dr. Gurdian and her staff are knowledgeable, caring, and go the extra distance." "I love this practice. Dr. Gurdian is the greatest! I also love Pat." "Friendly staff, always smiling, and ready to help." "I love their sweet, friendly, and knowledgeable staff. Always a great experience!" 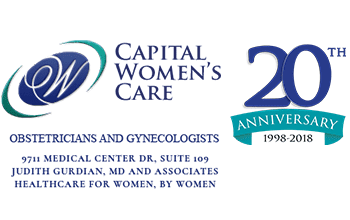 Capital Women's Care Rockville OBGYN is an all-female OB/GYN practice providing optimal healthcare for women, by women! The providers at Capital Women's Care Rockville OBGYN have decades of experience in different areas of expertise and interests. From high-risk obstetrics and gynecology surgery to menopause treatment and osteoporosis management, the highly trained team of OB/GYNs at Capital Women’s Care can treat every manner of women’s health concerns and issues. Collectively, the team has helped countless women through their pregnancies and deliveries, bringing thousands of babies into the world. As part of a premier group of around 200 providers in 30 locations throughout Maryland, Virginia, and Washington, D.C., the Capital Women's Care Rockville OBGYN physicians also serve the community at Adventist HealthCare Shady Grove Medical Center. We are proud to announce the addition of Dr. Tanya Ghatan to our dedicated team at our Rockville practice! "Dr. Gurdian is an amazing and caring physician, an astute diagnostician, and has come to become a dear and cherished confidant and friend." "The office staff is always so friendly. They make me feel like a friend not just a patient. I have been seeing the doctors for 10 years now." "The front staff is amazing! The entire staff is truly helpful and kind. I was very comfortable and relaxed. Thank you Capital Women's Care!" "Friendly staff, always smiling, and ready to help. The doctors, PA, and midwife are all very professional and most of all very caring." "Love everything about this practice. Their compassion, knowledge, and professionalism exceeds my expectations every time." "Dr. Gurdian is a phenomenal physician. She always demonstrates the perfect combination of knowledge and compassion." "Dr. Gurdian is an amazing and caring physician. An astute diagnostician that has become a dear and cherished confidant and friend." "I have been seeing the doctors for ten years now and each of them is very knowledgeable, kind, sweet and make you feel very comfortable." "Outstanding doctor. She diagnosed my uterine cancer when my last doctor told me that bleeding at my age was normal." "The front staff is amazing! The entire staff is truly helpful and kind. I was very comfortable and relaxed. Thank you Capital Woman's Care!" "Love every single person at this practice! I recommend this group for regular women's health visits to OBGYN needs! Friendly and very knowledgeable practice." "I am new to the area and am high risk. She carefully reviewed my history and picked up an issue that my old OBGYN had missed." "I've been seeing Dr. Gurdian for over 20 years and have referred all my neighbors and friends. She never ceases to amaze me with her caring compassion." "Dr. Gurdian has taken care of me for about ten years. She has delivered two of my children and has been wonderful." "I was very impressed with Dr. Spector. She was extremely accommodating, had a great bedside manner, and, most importantly, took the time to be thorough."